Opioids include illegal drugs like heroin, and prescription medications used to treat pain like Percocet and OxyContin. Opioids may help manage pain when taken as prescribed for a short amount of time, but have serious risks. Regular use often leads to physical dependence; withdrawal symptoms may occur if use is suddenly reduced or stopped. Risk of dependency occurs when medications are taken at higher than recommended doses, combined with alcohol or other drugs, or taken without a prescription. About 1 in 4 people receiving long-term opioid therapy in a primary care setting struggles with dependency. If you and your doctor are considering opioids, weigh the risk of dependency and overdose against expected benefits. Please ask your healthcare professional about alternatives. Take medication only as prescribed. Do not take more than instructed. Call a doctor if your pain worsens. Never mix painkillers with alcohol or sleeping pills, or other medications without your healthcare professional’s knowledge. Store your medication in a safe place. Teach your friends and family how to respond to an overdose. Discuss any concerns with your healthcare professional. Ask your healthcare professional about non-opioid alternatives for managing pain. Never share your medications with anyone. *Periods of abstinence and/or low tolerance increase the risk of overdose. *Please contact a doctor or treatment center if withdrawal symptoms occur. Labored breathing, difficulty breathing or shallowed breathing. Lips, fingers or face begin to turn blue. Respiratory depressions – slowed breathing, maybe only a few breaths per minute. Death Rattle – very distinct, labored exhale that may sound like snoring. This indicates emergency resuscitation is needed IMMEDIATELY. Get their attention – Shake the person’s shoulders and yell: “(name!) Are you all right? Wake up!” If no answer, do a sternal rub – make a fist, then rub your knuckles firmly up and down the person’s breast bone. Give Naloxone – give the medication 1-3 minutes to work, then further resuscitate with CPR (if trained) or rescue breaths if needed. If breathing isn’t restored after 2-3 minutes, give another dose of Naloxone. Stay with and care for the person until help arrives. 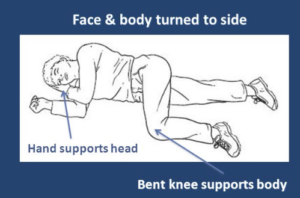 If the person can’t sit up, put them into the recovery position. If you administer Naloxone, please call the Poison Center at 800-222-1222 within 1-2 hours OR contact the organization that provided your training. *DO NOT slap the person, put into a cold bath, try to induce vomiting, burn the person’s fingers or feet, or inject with ANYTHING! Naloxone (NARCAN®, EVZIO®) is a prescription medication that safely and effectively reverses an opioid overdose. As of June 1, 2017, anyone can get naloxone at a Maryland pharmacy without a prescription. To learn more click here​​. Please contact your local health department for a Naloxone training near you OR get trained online here. Maryland’s Good Samaritan Law can protect a person who helps with an overdose from arrest, charge or prosecution for certain crimes. Calling 911 will not affect parole or probation status. The law DOES NOT protect against arrests for open warrants and crimes other than listed above. It also does not prevent police from gathering evidence or investigating.